An update to my status. My doctors continue to monitor my heart infection, but it appears cleared up, along with the problems in my abdomen. I met with my urologist on 4 Feb. My latest CAT scan (27 Jan) shows a small mass in my liver and that the tumour on my left kidney has not grown. 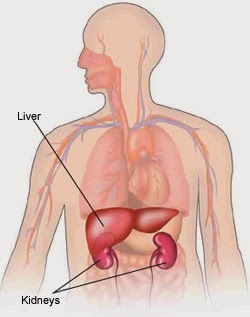 The mass is unlikely to be a metastasis of the tumour, but the first order of business is to biopsy my liver; this should happen in the next two weeks, and it may take a further two weeks to get the results. Meanwhile, I am on the waiting list for keyhole surgery to remove my left kidney; this should happen in about six weeks. (Hospitals are fined £1000 if it takes more than four weeks, but the Western General currently has thirty people over that limit.) Recovery time is about four weeks. So, with luck, back to work in ten weeks, mid-April. All four kidney surgeons at the Western General are in the top 10% in the country, so I am in good hands. If keyhole surgery converts to ordinary surgery the recovery time is three months; this happens in 4% of cases. My doctor says it is unlikely to happen to me because, compared to most of his patients, I am young, fit, and slim. Not words I usually hear applied to myself! Previously: Status report, A paean to the Western General. Whenever your morale gets low just remember the young, fit and slim comment. Good luck Phil! Sounds like you're keeping in good spirits! Best of luck with your recovery. I remember Julian being tickled at being described as "This young man" on some medical letter, in 2006! Glad you're feeling better. Must be scary at times all the same. All best wishes.